2009 marks 10 years of the Eurozone – it’s time for a bit of a celebration. So the European Commission has come up with the idea of minting some celebratory coins. So how should the design be chosen? Commission DG for Economic & Financial Affairs has launched an online poll to allow citizens to vote for their favourite 10-year coin design. Public Affairs 2.0 has some additional analysis, speculating on whether the Commission might have to adopt the design from the web vote if 1 million people vote in the poll. 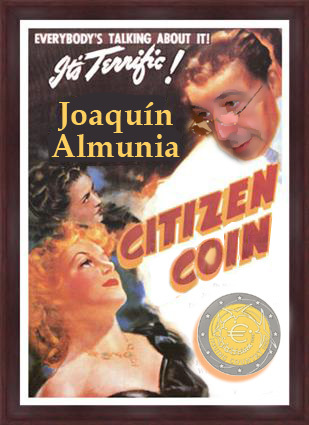 Rather than profound analysis I’ve just gone for Photoshop instead – Citizen Kane Coin directed by JoaquÃ­n Almunia anyone? I hear Britannia may be avaiable at short notice for numismatic appearances. The ECB are turning into the unexpected heroes of sensible long-term management of the economy, but they’re going to crucify club med in the process, which will be… politically interesting. Jon – glad to see your photoshop skills are better than our own poor attempts.